From left to right: Young-ho Kim (director of Korea Sustainability Investing Forum), Eunjoo Lee (Korean National Assembly member), Mok-hee Lee (Assembly member), Il-Pyo Hong (Assembly member), Ligia Noronha (Director of UNEP’s Division of Technology, Industry and Economics), and Hyo Jin Ahn (Deputy President of Shinhan Bank). 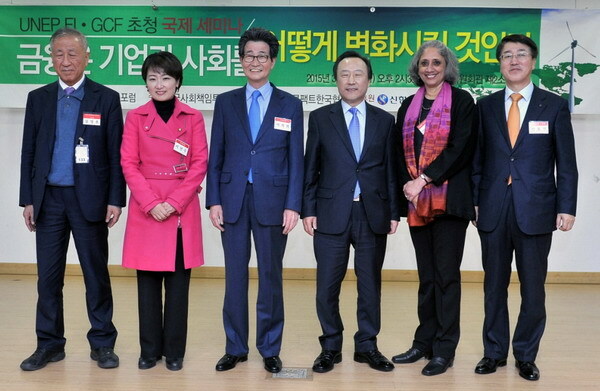 UNEP FI supported the Korea’s National Assembly’s Corporate Social Responsibility (CSR) Policy Research Forum held an international seminar entitled, “How will Finance Change Industry and Society”, on March 13, 2015. The Korea Sustainability Investing Forum (KoSIF) and the United Nations Global Compact Korea Network (UNGCKN) organized the seminar, which discussed sustainable finance, the emerging trend in finance sector. Around 160 people participated in the seminar. Ligia Noronha, the Director of UNEP’s Technology, Industry and Economics branch, delivered the opening remarks. She addressed the problem of insufficient flows of investment in long-term sustainable development and emphasized the importance of Korea and Japan in the growing Asian market. She wound down her speech by expressing her gratitude to UNEP FI members in Korea and others who are committed to sustainable finance. After these opening remarks, KoSIF presented an award to Shinhan Bank for their dedication to sustainable finance and CSR. In addition, KoSIF presented awards to Mok-hee Lee, Il-Pyo Hong, and Eunjoo Lee, the Assembly members who contributed to the Revised National Pension Service ESG Disclosure Act (NPS Act). Following this, further presentations on sustainable finance were delivered. Mr Youssef Arfaoui, the Green Climate Fund’s Mitigation Coordinator delivered a presentation on how Korean industry can be linked to developing countries’ climate change policy. Dr. Choon-seoung Yang, the director of the Korea Sustainability Investing Forum, spoke about socially responsible investing as one method of practising sustainable finance, and suggested all government pension funds consider ESG issues and disclose any related information. The final presentation was delivered by Yuki Yasui, the deputy Head of UNEP FI. She focused on the global trend of sustainable finance and the possible strategies which the finance sector can practice. She also addressed the goal of UNEP FI and the reasons why companies should join other UNEP FI-affiliated coalitions. Read the interviews (in Korean) with Ligia Noronha, the director of UNEP’s division of Technology, Industry and Economics and Yuki Yasui, UNEP FI’s deputy head on a recent visit to Korea. The interviews describe the practices of global sustainable finance as well as environmental, social and governance issues, especially in relation to the financial system and government-driven funds in Korea.